It’s been a while since we recorded a #DamienTalks specifically for the California website, but now we’re back with a good one. In this week’s edition, Damien Talks with Michael Manville, a professor and researcher at UCLA. Manville has hit a bit of Livable Streets fame with an article he wrote for the Journal of Transportation and Land Use. In that article, he outlines why laws requiring developers to invest in road widening to “mitigate” traffic created by their development don’t actually do anything to improve traffic flow locally or regionally. Almost nobody who understands transportation planning believes that these requirements do anything to improve traffic flow–yet these laws persist. Manville doesn’t only debunk the theory behind the laws, but also offers a solution…should policy makers heed his call. You can read “Automatic street widening: Evidence from a highway dedication law” at the Journal of Transportation and Land Use here, and a summary of the article from Streetsblog USA here. We’re always looking for sponsors, show ideas, and feedback. 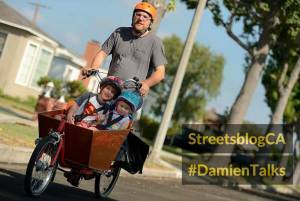 You can contact me at damien@streetsblog.org, at twitter @damientypes, online at Streetsblog California or on Facebook at StreetsblogCA.